JS Miniatures Blog: News, Updates and New Products! Time is flying past! Blogging seems to be one of those things that keeps getting left for another day when I'm less busy and then suddenly I realise it's been over a month and I haven't updated you all on what's happening! I will try to do better! In my defense it's been a very busy start to 2013 for me. I have been running an online workshop for Minis4All during February on using LEDs in miniature projects which has been very successful and I have also had an interview with Kirsten Miller of UK Handmade for her "Inspire: The Road Less Travelled" series. You can read more about both of these events below. I also have some very exciting news! After a successful trial in the LED workshop I have been working hard on improving my lighting kits for smaller scale houses - 1/48th & 1/144th. I am hoping to have the new prototype kit ready this week with the kits available for sale very soon! If you would like more information please contact me: jsminiatures @ gmail.com (please remove space before and after the '@'). I spent most of January designing suitable kits for the online workshop. I wanted all the projects to be simple to make and tailored for those who have never used an LED before in their life. I also wrote a "Beginners Guide to LEDs" with all the basics so that the ladies could understand how LEDs worked. The workshop is very much aimed at those who usually get their husbands to do the electrics but would very much like to have a go themselves. It's really not that complicated, it just seems scary! I'm not an electronics expert so there's no complicated mumbo jumbo! I will be offering the workshop through my website shortly so if you are interested and would like to take part please contact me for details. 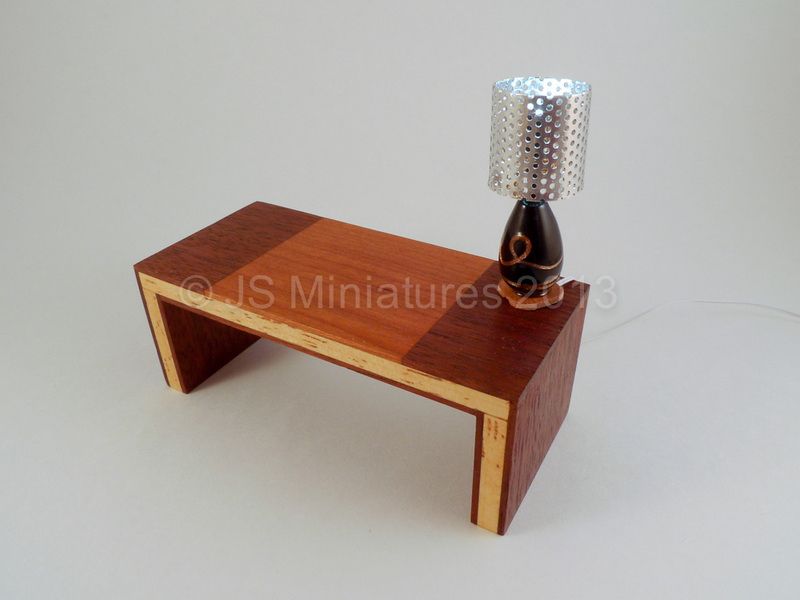 jsminiatures @ gmail.com (please remove space before and after the '@'). The lights shown will be available for sale at the online miniature show next week. More on that tomorrow! Kirsten Miller of Quernus Crafts started doing a series of interviews 2 years ago with people, like her, who have given up their day job (whether through choice or circumstance) and who want to share their story. The series is called: "The Road Less Travelled". Ooh the lights look amazing. Will you be selling the lights through your website or just next week ? Hi Moonstorm. 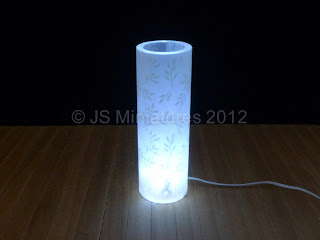 I'll be selling them through my website too but I only have the 1 table lamp with that exact base. I will be making others with different coloured bases. 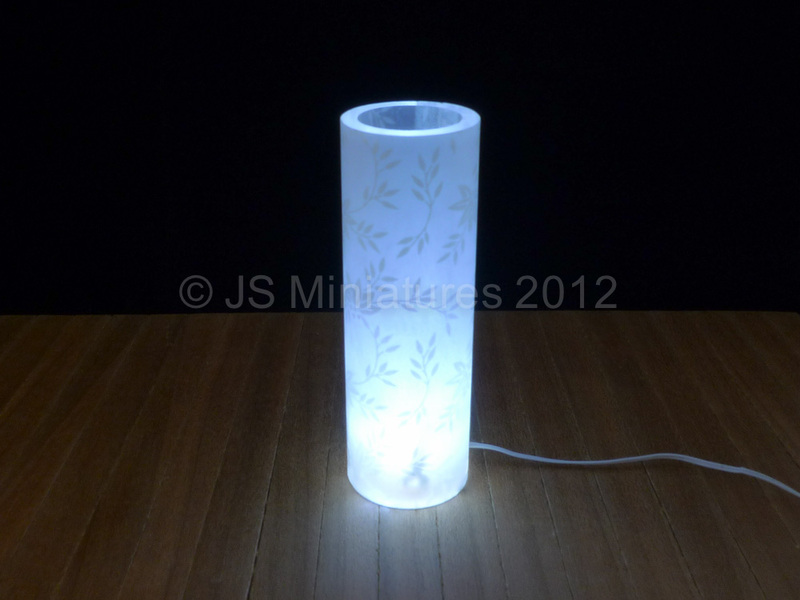 The tube lamp has 2 designs - the one shown and a bamboo design that was quite popular in the workshop.